2015 Qualified Remodeler Top 500! Additional information is available in the August 2015 print issue of Qualified Remodeler and online. Who better can you trust for Solar? The sun arrived on this rainy day! Check out our new Franzoso Energy Solutions truck! Mark Franzoso from Franzoso Energy Solutions addressing the Hudson Valley Gateway Chamber of Commerce on the advantages of solar energy recently in downtown Peekskill NY. The Society of Our Lady of Mount Carmel invites you to our 92st Annual Italian Feast, Wednesday through Sunday, July 16-20, starting nightly at 6pm. Along with rides, food and games, there is musical entertainment every night at 155 Highland Avenue (Our Lady of Mt.Carmel Way) in Verplanck. Free Admission & Free Parking. Saturday at 6pm, the Verplanck Fire Department will be hosting a Firemens Parade through the streets of Verplanck, with the parade concluding into the Feast grounds. Sunday morning at 11am, there will be an Italian Mass at St. Patrick’s Church on 11th Street in Verplanck. A traditional procession through the streets of Verplanck, with the statue of the Madonna follows Mass. All are welcome to join in. Sunday night at 11pm, our Grand Finale Fireworks Extravaganza, presented by Garden State Fireworks, will cap the weekend’s festivities. Discount ride bracelets are available every night with coupons found at area merchants. Nightly food choices include pizza, pasta, sausage and peppers, zeppole, Italian Ice, cannoli, gyros, seafood and more! A traditional Procession with the Blessed Madonna Statue will take place FRI, SAT & SUN Nights along the Street of the Feast at 9pm. Also appearing at the Feast will be Miss Italia – Hudson Valley. There will be “Dancing in the Street” every night of the Feast. Friday- DJ & DANCING UNDER STARS Including 6-8pm Country Line Dancing with WLNA, 8 PM – Peggy Izzo’s Dance Workshop performs, 9 PM – Couples compete for Best Dancers Prize, 10 PM – The Tarantella! Franzoso Contracting of Croton-on-Hudson, NY, has received GAF’s 2014 President’s Club Award. A GAF Master Elite(R) contractor since 1998, the company has three divisions, handling replacements, interior work, and solar and air sealing. Croton-on-Hudson, NY – Franzoso Contracting, Inc., of Croton-on-Hudson, New York, has received GAF’s most prestigious contractor award: The GAF President’s Club Award. This highly coveted award recognizes Franzoso Contracting as one of the “elite of the elite” residential roofing contractors in the United States. “Our commitment to quality products, superior craftsmanship, and renowned customer service make Franzoso Contracting the unparalleled leader in home remodeling in our region. Plus, our reputation is backed by 35 years of experience. We are proud to receive this elite industry designation for the fourteen consecutive year in a row–it separates us from our competition in a very meaningful way,” said Franzoso. Since 1980, Franzoso Contracting has been serving customers in Westchester, Putnam, and Rockland Counties in New York State and Fairfield County in Connecticut, by providing siding, windows, doors, roofing (both new and repairs), and gutters. In addition, Franzoso Contracting provides Roof Shampoo to clean dirty roofs and its Polar Vortex Steamer to remove ice dams in the winter. Franzoso Contracting also recently launched its solar division to accommodate the growing popularity for solar powered homes. Franzoso Contracting supports a variety of business and non-profit groups and associations including: the Hudson Valley Gateway Chamber of Commerce, where Mr. Franzoso served as Chairman of the Board; Rotary Club; The Friends Network, which supports children with special needs; Support Connection, a breast- and ovarian-cancer support group; Habitat for Humanity, which provides homes and home repairs for families in need of safe, warm and dry homes; and Purple Heart Homes, a veterans’ group that arranges for home repairs for wounded or disabled US veterans where Mr. Franzoso serves as Vice President. We finished our 3rd Property Brothers project, and Mark Franzoso checked out the 4th project yesterday! We are scheduled to shoot at the end of this month! We will continue to keep you updated about this exciting experience and opportunity! Between April 1, 2014 and April 1, 2015, the Rockland County Office of Consumer Protection, cited 101 contractors for working without a valid license. With warmer weather prompting thoughts of home improvements, some due diligence can prevent lots of heartache. 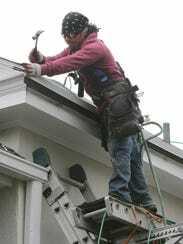 Anyone considering a new roof, kitchen or bathroom should ask contractors about licenses, insurance and worker safety. Homeowners should also check with county consumer protection offices to verify licenses and ensure that a contractor doesn’t have a checkered past. Homeowners have good reason to be on guard. Between April 1, 2014 and April 1, 2015, the Rockland County Office of Consumer Protection cited 101 contractors for working without a valid license. Westchester County maintains a Renegade Renovators list on its website to warn homeowners about bad contractors who have lost their licenses or never had them. As for safety, last year inspectors from the Occupational Safety and Health Administration cited 118 companies. Many of the safety violators were contractors, including Franco Roofing of Yonkers for its work at a private home in Katonah. 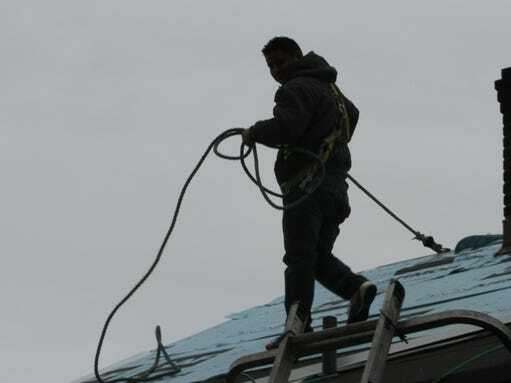 Franco Roofing’s violations earned the year’s second biggest fine — $44,028. OSHA holds employers, not homeowners, liable for worker safety violations. Still, it’s important to ask about safety plans. “If you’re hiring a contractor, stay home on the first day. You should be able to tell what is dangerous,” said Terrence Cortelli, an attorney in White Plains who handled a case for a worker who fell and fractured his pelvis and wrist at a Rye home after his boss didn’t set up proper scaffolding. Cortelli said every homeowner should ask a contractor to name them as an additional insured party in the company’s insurance policy, and if the contractor won’t show the homeowner a certificate verifying the addition, it’s a red flag. Mark Franzoso of Franzoso Contracting in Croton-on-Hudson said his company adds homeowners as an additional insured party, and the company runs safety training for its workers. “That’s something many homeowners do not take into consideration in choosing a quality contractor. They go right for the price and do not realize the jeopardy they’re putting themselves in if something happens,” said Franzoso. Franzoso said another red flag is subcontractors with magnetic signs on their vehicles’ doors. Falls are a major cause of construction-related deaths, according to OSHA, whose most frequently cited violation in 2014 was fall protection. OSHA cited Franco Roofing for 11 violations, including fall protection, improper worker training and head protection. 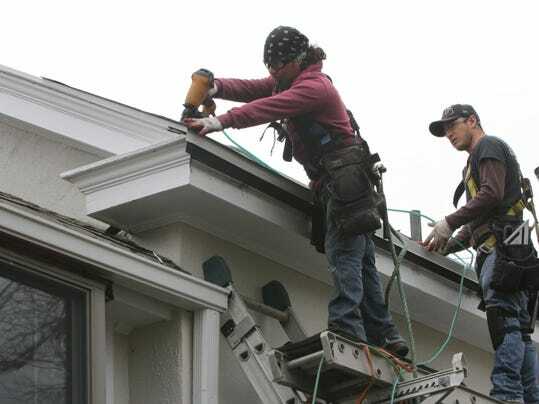 Diana Cortez, OSHA’s regional director in Tarrytown, said workers on roofs must use some kind of fall protection, which can include rails at the edges of the roofs or, more commonly, harnesses tethered to an anchor affixed to the top of the roof. More than a third of the local companies cited by OSHA last year for violations were inspected after someone complained about working conditions. “Employees are really learning what their rights are, and understanding what is a hazard, and to report it if their employer isn’t rectifying it,” said Cortez. Rachael Risinger, a State Farm spokeswoman, said that in general homeowners are protected under most home insurance policies if something goes wrong, whether the contractor is licensed or not. The lack of a license would become an issue if the contractor or worker were to sue the homeowner for liability, she said. The Insurance Information Institute, a trade group, said that a homeowner or the contractor should have at least $1 million in liability insurance before a project starts. There are several government websites homeowners can visit to check a home improvement contractor’s record. Those websites include consumer guidance, lawsuits, liens and judgments, as well as OSHA’s establishment search page that documents safety violations.